This page primarily deals with the Aristo Large Scale 2 foot radius turnout with a little information on the new Aristo Wide Radius Turnout. The Aristo turnout is physically interchangeable with the LGB 1200 series turnout but it also differs from the LGB turnout in several ways. The wiring underneath to cross connect the tracks is implemented with a wiring harness. This harness doesn't appear to be as reliable out of the box as the welded straps in the LGB turnout, but it can be fixed. The turnout motors draw less current, but operate slower and are more mechanically complicated. The motor includes a SPDT accessory contact, extra contacts are an extra cost option on the LGB turnout. The automatic turnout operates fairly well as a spring switch when the turnout is set to "straight." The curved point rail has an additional spring that allows it to push over easier. Operation as a spring switch is better than the LGB turnout with a manual control box. LGB automatic turnouts do not act as spring switches, the points push over and latch. The Aristo turnout motor is not well weather sealed. I have no experience with them out of doors, but I would not expect them to hold up as well in the weather without some kind of additional sealant. I have 19 Aristo right hand turnouts on my indoor layout, The Geologically Improbable Railroad, Mountain Division. This came about because the day that I bought all my turnouts, San-Val had only LGB lefts and Aristo rights, so I've got a mix. All 19 turnouts are still providing adequate service, but ALL of them needed work and I still have occasional problems with interconnection and motor failures. Corrective actions are described below. The first and most annoying problem was the tendency of 4 wheel rigid wheelbase locomotives (such as LGB and Lehmann), to stall on the turnouts. In fact, it was not a "tendency" but more of an "every time" kind of thing. Aristo locomotives have independently rocking axles and are more tolerant to these turnouts. The problem is that the frogs are about 15 mils too high. When a driver wheel runs over the frog, it picks up that side of the engine and lifts the other driver on that side off the track. The plastic frog is long enough to allow a driver and the slider to rest on it, so as soon as the slider and one wheel move onto the frog, the engine stops dead. Each and every turnout did the same thing. This had to be fixed. The solution was to remove every turnout from the layout and mill off the excess plastic. This had to be done not only on the top of the frog, but in the flangeway as well. The standard height of a large scale flange is 0.125". The flangeways are also 0.125" deep so that even if the top of the frog is milled flush with the rail without milling the flangeway as well, the flange will ride in the bottom of the flangeway and hold the wheel up just the same as before. I had access to an end mill so I clamped every turnout down flat and milled off the frogs flush with the railhead and then milled down the flangeway so that it was once again 0.125" deep. This fixed the frog problem completely. I would hope that Aristo fixes their molds for future production runs. I had initially tried to modify the frogs with a Dremel tool, but a hand held tool is just not adequate. I made the turnout work, but it was real ugly. If you modify the frogs, you need to find a friend with an endmill. If you completely mess up a frog, you can get a replacement frog from Aristo. As of March 1999, Aristo has apparently changed the design of the frog such that this tedious mill work is not necessary. The frogs are now even or slightly below the railheads so that the above mentioned problem does not occur. 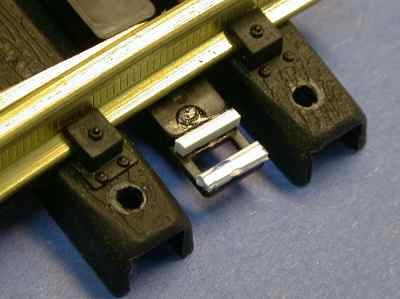 Improperly fitting points are probably the most common cause of derailments on any turnout and the Aristo turnout is certainly no exception. Mass produced parts cannot be expected to fit together with the precision required to make a properly operating point. I regularly grind and file the points on Aristo and LGB turnouts to make them operate properly. To adjust a point, use a single wheelset (preferably metal but plastic will work) and run it thorough the point while pressing and twisting in every possible direction. Your train's wheels will come through at all angles, so the point must be able to accommodate all cases. If the point can even be felt at all, it needs work. Use a motor tool and a grinding wheel and/or a small file to sharpen the point so that it the wheel doesn't feel the point any differently than an ordinary rail. Watch carefully as the wheel goes through the point and take off any metal that the flange touches. You may take off quite a bit of metal. I've done this so far to about 75 turnouts, and there hasn't been one that couldn't be fixed in less than 5 minutes of careful work. The point of an Aristo turnout rides on a plastic ridge on the tie at the point. It appears that the factory has done some grinding on this ridge to set the height of the point, but sometimes they overdo it. 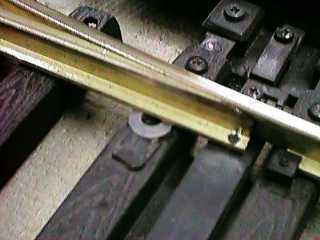 On some turnouts, the point rail is too low which will sometimes cause a wheel to lift from the point rail causing a locomotive stall. In this case, I glue a 1/32" thick #6 nylon washer (the same ones that I use to shim wheel axles) to the tie strip to raise the point rail. I use nylon here because it is smooth and resists abrasion. The point rail slides more easily on nylon than it would on styrene or brass. I've used contact cement or Crafter's GOOP to attach the washer. The Aristo turnout motor uses a small can motor geared to the throwbar through an "over center" type spring drive. The motor does not flip as fast as LGB motors so that automatic operation with LGB 1700 contact switches and high speed trains may not work all the time. The motor does draw less current that the LGB motor. Also, the motor is protected by a limit switch and a pair of diodes such that continuous application of DC power will not harm the motor. The response to inadvertent application of AC to the Aristo motor is different than the LGB motor. The LGB motor will buzz loudly telling you that something is terribly wrong. After a while it'll burn up. An Aristo motor will self rectify the AC and it will madly cycle back and forth, again telling you that something is wrong as it will make a lot of noise. I don't know how long it will put up with that abuse but it shouldn't burn up immediately. The wires that connect the motor to the circuit board are typically too short. The motor kicks around a little during operation, and I've had several motors tug on the wires and rip the trace right off the board or break the wire at the motor terminals. I reroute or replace the wire so that the wire isn't under tension. I have had considerable troubles with Aristo motors sticking and not wanting to flip, especially in only one direction. After manually cycling it a few times, the motor will usually start to work again. This is caused by dirt or oil fouling the limit switch inside. The limit switch is a sliding contact on the bottom of the throw bar which slides across pads printed on the printed wiring board inside the motor. If a contact fails the motor will cease to work. It is important to keep the motor clean and dry. Dirt, oil or even graphite lubricant on the board will mess it up. If you are having problems where you think that you ought to lubricate the throwbar, DON'T DO IT. The lubricant will eventually foul the limit switch. If your motor is misbehaving, take it apart and clean it with rubbing alcohol to remove all the internal contamination. Also do not try to "adjust" the spring tension on the sliding contact. That will put so much upward pressure on the throwbar that it will surely bind and fail to operate properly. The accessory contacts are fabricated the same way as the limit switch so if your accessory circuits become flaky, the motor needs cleaning. Sometimes a throwbar will bind because the coil spring behind the limit or accessory contacts becomes dislodged. This will prevent the contact from retracting and bind up the works. If you suspect this, gently pry up the contact on the throwbars. If the spring isn't set properly, pull the contact off, reset the spring and press the contact back on. If the motor gets cocked with respect to the turnout, it'll cause the throwbar to bind. Make sure that nothing is pressing the motor up or down. On some motors, if the three screws on the bottom of the motor housing are fully tightened, the motor will bind. Sometimes you just have to loosen the screws to get it to work. There is a screw that connects the motor throwbar to the turnout throwbar. This screw sticks up and looks like it needs to be tightened. If you tighten it, the turnout will stop working as the screw will drag below the throwbar. After all this discussion about binding, you might guess that this is a problem. Save yourself some grief and fully test the motor before you install or reinstall it. With the lever set both ways, fully exercise the throwbar. If it doesn't snap back when pressed against the spring, keep working on it. Any hesitation in the snapback will result in an inoperable turnout when the additional load of the turnout is placed on the motor. The connections to the point rails and across the frog are made with a little wiring harness under the frog. They can be accessed by removing a plastic cover from the bottom side of the turnout. I found that a few of these were miswired from the factory resulting in a short circuit. Others were improperly crimped and didn't make contact. I should have taken the clue and disassembled every turnout and soldered all wires to their lugs, but I didn't. I only fixed the ones that were actually broken. Since then, I've had several crap out. Since most my turnouts are now ballasted in place, I'm not going to pull them to fix a stupid wire. I simply solder a new wire to the track to provide the proper current path to replace the function of the failed harness. I try to route these wires as unobtrusively as possible. These wiring harnesses are made from fairly small wire. If you power your layout from a hefty power source and you get a track short such that the current must flow through a turnout, you might fry these wires. They won't be able to handle 10 amps. In this case, it might be a good plan to replace the wires with something heavier or bypass the harness all together and solder wires right to the rails. I've never melted one of these harnesses myself, but I have heard reports from folks that have. The original large radius (10' diameter) turnout had problems with certain USA Trains locos and the frog. The track slider would drop into the frog. This has been fixed on later production units (mid 2000 and later). These will handle the USA sliders fine. The large scale turnouts often require some adjustment to the points. This isn't unique to these turnouts, I have yet to see a preassembled turnout from ANY manufacturer that didn't need some tweaking. Usually all that is needed is some point filing, but some throwbar adjustments are sometimes required as well. The Aristo large radius turnout is shipped with a manual control box. A regular Aristo motor will fit right on. An LGB motor will fit on the straight side as well without any modifications. On the curve side, the fifth tie from the end needs to be trimmed a little to allow the motor to fit. Unlike the tight radius turnouts, no modifications to the throwbar are required to mount an LGB motor. The tie strips of the large scale turnout seem to be thicker and tougher than regular Aristo US style track. The rail clips are markedly heavier, a change that should be incorporated in the regular track. There were some wiring problems with the early versions of these turnouts. An anonymous SEPGRS member writes: "There's a potential weak link in the new AristoCraft wide radius turnouts as they are shipped from the factory. This article identifies a potential problem with the jumper wires in each turnout and an easy 5 minute fix. If you're running track power, you should make this fix. If you're running battery power, this won't apply to you. 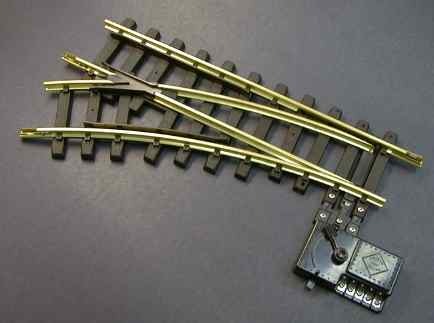 After you remove the cover plate on the bottom of the turnout, there are several jumper wires which supply current from the main rails to the point rails, and to the diverging rails on the other side of the frog. These wires are very small, probably only 24 gauge. One pair of these wires connect to a pair of short rails opposite the guard rails, next to the frog. 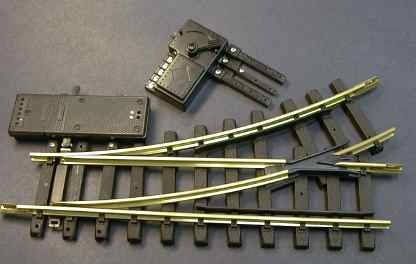 Certain locos, especially those with slider contacts, would short out as they crossed the frog, so the Polks advised cutting those wires as they really are unnecessary. Turnouts shipped in the summer of '98 had those wires attached. Turnouts shipped in the fall had those wires already cut. And turnouts shipping this winter do not have that pair of wires installed. You should remove the cover plate on every turnout and make sure that this one pair of wires is disconnected, as shown. But leave the other wires connected, they supply current to the points, etc. While you have the cover off, I recommend replacing another pair of wires because they are much too small for the amount of current they must carry. I have decided to install heavier wires in their place, to carry the current from one side of the frog to the other. It seems likely that the factory wires would overheat and fail in those situations where you are running multiple engines and numerous lighted cars, which together could draw the better part of 10 amps. I prepare a 3 inch length of 16 gauge wire by stripping both ends, and attach a lug (Atlas spade connector #3) to each end with a crimping tool. Then I remove the factory wire and lug and install this one in it's place, as shown in the figure in bold. Install the second one in a similar manner, and you're done. I feel it is unnecessary to upgrade the remaining wires to the point rails because they conduct current only when a motor block is riding across the points. And the amount of current being fed to the points is just that for one motor block, not for all of the trains on the layout. This 5 minute fix will save you from having to remove a turnout later from your layout to repair burned wiring." The Aristo turnout motor has five connections as shown in the diagram. The motor can be operated from Aristo's control that comes with the turnout, or it can be operated from an LGB control box or you can wire your own as shown below. The Aristo control box is a little flaky, for the short time that I used them, several became intermittent or completely crapped out. The Aristo turnout itself is acceptable for out of doors use, however the motor is not. It will not withstand the weather for long. If you use the Aristo turnout out of doors, or the Aristo motor just doesn't work, a better motor can be easily installed. When Aristo designed the turnout, it looks like they intended to allow their motor to be replaced by an LGB turnout motor. The mounting features are identical. All that is needed is to remove the three screws between the motor and the turnout that are nearest the turnout itself. The LGB motor just screws back on with the two larger screws. This motor has the LGB 1203 accessory switch attached. There is one feature on the turnout that needs modification. The pin on the end of the LGB motor throwbar isn't quite long enough to reach through the Aristo throwbar. This is easy to fix. Two pieces of 0.062" x 0.062" x 0.375" are attached to the Aristo throwbar with Zap-CA as shown in the photo.